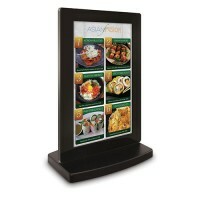 Sidewalk/Menu Boards set up in the middle of pedestrian traffic so you can direct customers into your café, restaurant or any other establishment. Choose from tackable fabric surfaces, chalkboard surfaces, and dry erase surfaces in multiple colors. We also offer mobile boards that roll and A-frame boards that fold, so you can cut your losses in an unproductive spot and quickly move to another area. Browse our selection and get set to expand your customer base.